← Bits: Memorial Day Weekend. Ummm…yeah, I’m a little off my schedule! It’s just that last weekend was so action-packed and exciting, that the rest of my week was spent recovering. So anyway…on to this post! Little Alice turned two months old a couple weeks ago. The rule for the 2-month-old photo was to make her as girly as possible. And I (almost always) follow the rules! 1. Sleeping through the night. Going to bed at 10p and waking up at 7a. Because she is an angel. 2. Sticking her tongue out. It’s her new trick and she loves it! 3. Playing on her playmat because it has a mirror and she loves to laugh and coo at herself. 4. Laughing and cooing. She does this a lot and it’s awesome. 5. Putting up with her brother and all his “love.” His “love” includes frequent squeezing “hugs” and slobbery kisses. She’s a great sport. She’s a seriously happy, smiley, coo-y, sleepy, laid-back gem of a child and I couldn’t feel luckier to be her mama. 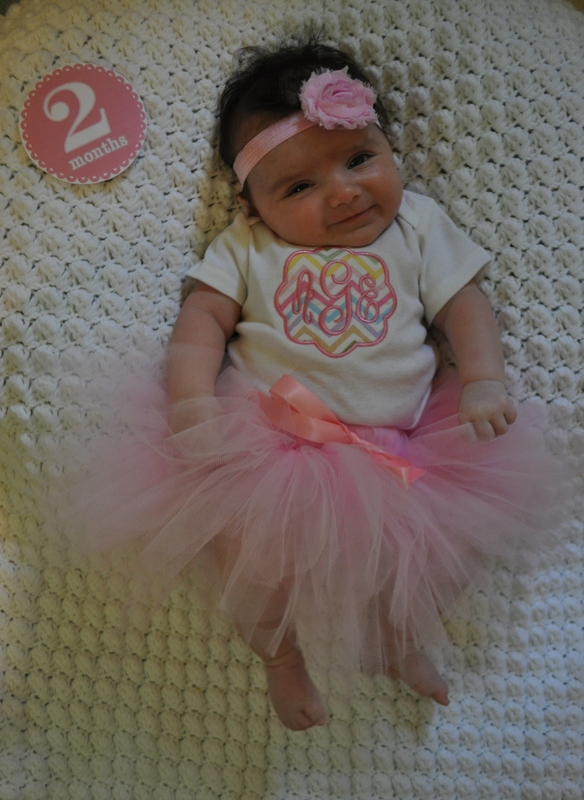 Happy 2-month-old birthday (a couple of blog weeks late) sweet baby, Alice! 3 Responses to Tutus At Two Months. awwww… she looks so happy and girly! What a wonderful sweet girl – just like her mama!